Just back from a very wet weekend in Glen Tanar. It rained heavily and constantly from the moment I left Inverness until I arrived back today. Not the perfect conditions for camping and a BBQ one might think. But one would be wrong! The barbeque was dragged into a dilapidated old stable. The holes in the roof let the smoke out and we had a perfect cooking area. Outside we erected a tarpaulin shelter under which we chatted and ate and drank and eventually danced into the wee hours. And the best bit? Listening to the rain pitter patter on the tent as I fell asleep. Wonderful. I am now a fan of camping. D will be delighted. 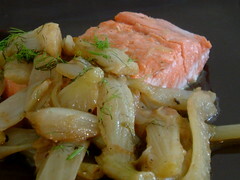 After a weekend of excess dinner this evening had to be light: braised fennel with steamed salmon. This is my favourite way to eat my favourite vegetable. The fennel’s flavour is enhanced by the slow cooking and the butter gives this dish a wonderfully luxurious edge. Half the bulbs length ways and slice into 1cm wide strips. Wash and dry thoroughly. Melt butter in heavy based pan. When the butter starts to turn brown and smell nutty add the fennel strips. Cook gently for 10 mins, stirring frequently to ensure all sides are cooked in the butter. Add enough stock to cover the bottom of the pan and cover with a tight fitting lid. Simmer over a very low heat for 20 mins. You may need to add a little more stock. When ready the golden fennel should be entirely soft with just in a little buttery stock remaining. Sprinkle with the fronds. I have never tasted fennel. BUT, the nursery where I get my plant starts has EVERYTHING at practically give-away prices. Anyway, while I was rummaging them, I saw fennel and ALMOST bought a couple of plants. I didn’t because I wasn’t sure it would be something I would ever use. But, after seeing your recipe, I am reconsidering. I cooked fennel once and totally loved it. Your lovely post reminds me to use it more! Does the digestion no end of good. Love the stuff – have you tried growing it? I would like to say ‘sounds like fun’. but camping is just not for me! I would have liked to have come to the barbecue and then be driven home, in a slightly tipsy state, to my own bed. Jolynna – Hello. 🙂 I hope you do try it. It’s definitely one of my favourite veg. It has a very different flavour depending on how you cook it. Anh – I go through fennel phases where I eat it several times a week. Then I forget about it for a while and rediscover it months later. It’s always a joy! Lucy – I haven’t tried growing it yet. Next year perhaps. Think I may have to extend my veg patch though. Want to grow everything! Holler – I thought the same until this weekend. Am a definite camping convert now! Nothing like a good camping weekend! I love to camp. I am such an outdoors person that I cannot believe I have been an accountant stuck behind a desk for X amount of years! But no more! On my semi-retirement I try to spend most of my waking hours outside. That is why I love gardening. OK, back to camping. Just the smell of the campfire is enough for me and fresh air. Rain is just mother nature making sure everything is clean for ya. Then, best of all, having a nice glass of wine, or 2, around the campfire with friends – now that is living! Fennel – what a wonderful veggie. It is one of those that you can eat raw in a salad, grill outside, braise on the stove or roast in the oven. So many ways to use it! Yours sounds great as simple sometimes is the best! Erika – I’m a long time fan of fennel tea! Peppermint too. I found your recipe a while ago and have been meaning to try it. A special on fennel in the supermarket was the perfect reminder. It was delish. Will definitely make again.